Syria Has Learned About Airstrikes On ISIS Via 'Iraq And Other Countries' : The Two-Way Word that some communication is taking place helps explain how military jets from the U.S.-led coalition and Syria have avoided clashing as they attack targets on the ground. 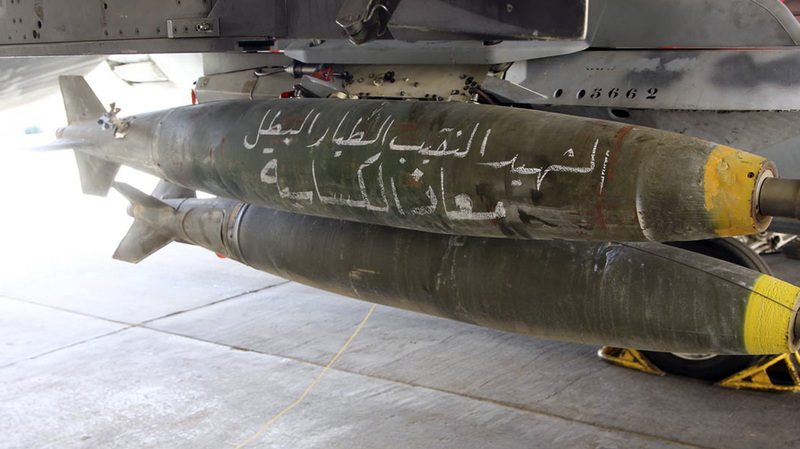 Bombs are seen on a Royal Jordanian Air Force jet at an air base before it leaves to strike ISIS in Syria last week. Jordan is part of a U.S.-led coalition of countries fighting the extremist group. Syrian President Bashar Assad says his government is being informed about the U.S.-led coalition's attacks on the extremist group ISIS — but that there's no dialogue between Syria and the Americans. Assad said word comes through Iraq and other nations. "There is no direct cooperation or link," he said, adding that information comes "through third parties ... Iraq and other countries. Sometimes they convey [a] message." The Syrian leader's remarks came in a rare interview granted to the BBC's Middle East editor, Jeremy Bowen. 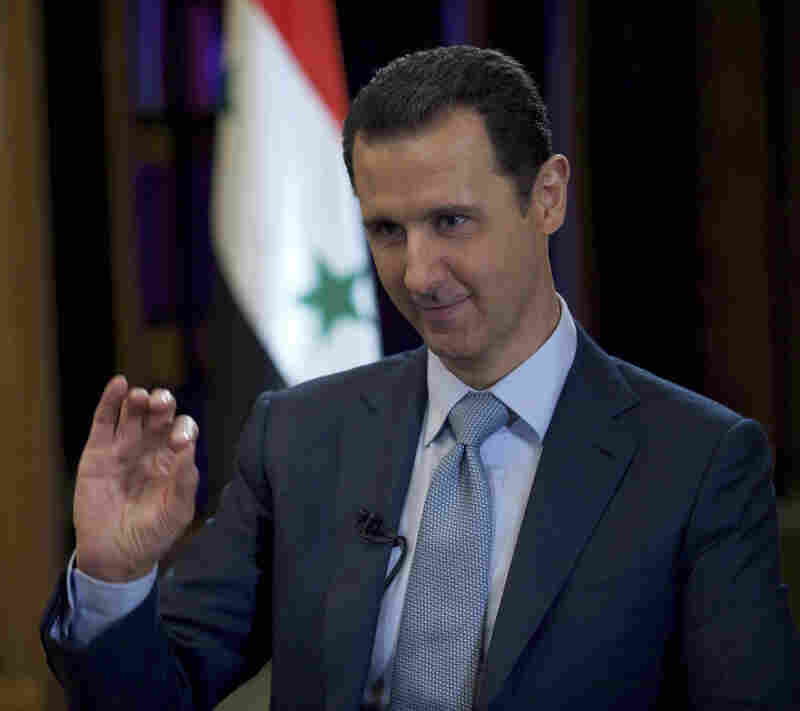 Syria's President Bashar Assad is seen Monday during the filming of an interview with the BBC in Damascus. Assad said third parties including Iraq were conveying information about a U.S.-led campaign of airstrikes against the self-declared Islamic State group in Syria. Assad's statement that some communication is taking place helps explain how military jets from the coalition and Syria have managed to avoid clashing with one another as they attack targets on the ground. No tactical information and no details about the military operations are included in the messages, he said. "They don't talk to anyone, unless it is puppet. And they easily trample over international law, which is about our sovereignty now. So they don't talk to us, we don't talk to them." Addressing charges raised in the U.N. and elsewhere that Syria has used "barrel bombs" to indiscriminately target Syrian civilians, Assad told the BBC, "We have bombs, missiles and bullets. ... There is [are] no barrel bombs, we don't have barrels." The Syrian leader spoke as his country remains embroiled in what U.N. officials say is a crisis in which more than 12 million people in Syria need humanitarian aid, with another 3.8 million having fled to nearby countries. Assad dispelled the idea that there might be an ongoing conversation with the U.S. about Syria, its civil war and ISIS. "There is no dialogue. There is, let's say, information. But not dialogue," he said. When asked if Syria shares any information with the U.S., Assad gave his answer, and a quick smile: "No."